With smaller bunkers, shorter rough and new forward tees, Tiffany Greens Golf Club is trying to make fun par for the course. While still a challenging 6,648 and 7,055 yards from the two back tees, Tiffany Greens has responded to laments of the average and casual golfers that the course was too long and difficult, said Head Golf Professional Doyle Harris. The Northland course opened in 1999 during the “Tiger Boom” when golf was peaking in popularity and courses were made longer and harder, Harris said. As years passed, golf started losing business to other recreational endeavors. “People were getting frustrated with how tough the game was and we wanted to make it easier and more fun for them,” Harris said. Research showed that the course was about 1,000 yards too long for most players, so Tiffany Greens decided last year to build 14 new forward tee boxes to enable short hitters to have a chance to reach greens in regulation. Work continues on those tee boxes, but meanwhile tee markers have been moved up and added and there are now five sets intended for players of all levels. Tiffany Greens also determined that it had too many large bunkers, many with severe lips, that caught too many shots and were too difficult to escape. The high-edge bunkers also tended to wash out in heavy rain. Most of the 42 traps were shrunk and the lips eliminated. A few traps that were not often in play were replaced with all-grass turf. Rough was cut shorter to help golfers recover more easily from wayward shots. Players of all ages and abilities gained from the change. “We are trying to make the game more family-friendly,” Harris said. 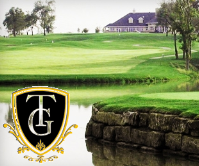 Designed by Robert Trent Jones II, the par-72 Tiffany Greens has always been considered a premier course in Kansas City. The course hosted the U.S. Senior Tour’s TD Waterhouse Championship in the early years. Signed photos and flags from the event are displayed in the lower level of the clubhouse. 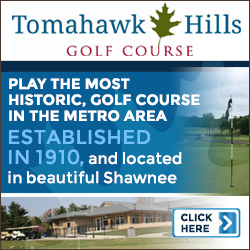 Tiffany Greens, just south of Kansas City International Airport at 5900 NW Tiffany Springs Parkway, meanders through woods and meadows on the front nine and through an upscale subdivision of homes on the back. 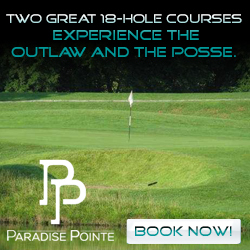 Each hole is unique and provides golfers a good view of desired landing areas off the tee and in subsequent shots. 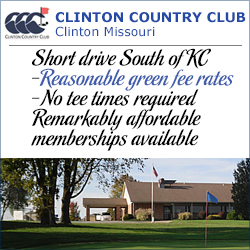 The course is also known for its smooth and speedy greens, compliments of the ground grew headed by Superintendent Randy Cox. The beauty and brawn of the course is perhaps most evident on the first hole, a downhill par 5 with a small lake that juts into the fairway from the right and gobbles up many a second shot. Harris said No. 1 is the signature hole and presents golfers with a second-shot choice of laying up to the left of the water or going over in hopes of reaching the green. The wind has a lot to do with how that hole is played, he said. Harris said the finishing holes, 16, 17 and 18, also stand out. No. 16 is a par 5 and Nos. 17 and 18 and are par 4s. All three are doglegs. “They are holes where a lot of things can happen,” Harris said. Tiffany Greens is a course where most of the trouble is the left, with the notable exception of the first hole, Harris said. In its efforts to broaden its appeal, Tiffany Greens has number of leagues and golf social groups, Harris said. One ladies golf group that had dwindled to ten players is now up to 40 to 50 on most evenings as the course was made more player-friendly and rules loosened, Harris said. There is still a serious side to golf at Tiffany with leagues, tournaments and a young professional program for players under 30 and under 40. Tiffany Greens is popular for weddings, reunions and other social events in its ballroom and dining areas. The ballroom can host events for up to 200 people, under the guidance of Krissy Frewin, food and beverage manager. She can be reached at 816-880-9600, ext. 224 or at kfrewin@tiffanygreensgolf.com. A dining area and deck for after-golf food and beverages overlooks the course. The course sells golf apparel and equipment in the spacious pro shop. Players can be fitted for clubs at no extra cost. 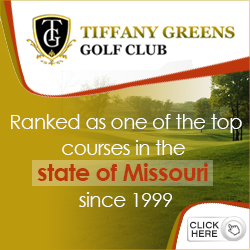 Information on golf programs and memberships at Tiffany, along with green fees and details of the course can be found it its website, www.tiffanygreensgolf.com. The main phone number is 816-880-9600. Harris and the pro shop can be reached at ext. 206 and the pro shop at 208. Kyle Hurst is general manager and PGA Director of Golf at Tiffany Greens. He is at ext. 223. Either Harris or Hurst can provide more information on course offerings over the phone or via email. Harris is at dharris@tiffanygreensgolf.com and Hurst is at khurst@tiffanygreensgolf.com.